What does it mean to live with Integrity? How might committing to align our hearts, minds, spirit, body, and voice be a radical act? How do we deeply listen from a heart space? Can knowledge of self transform how we see ourselves integrating into our communities? We cannot wait to ruminate on and be inspired by these questions and the Quaker testimony of Integrity, joining with activists of all sorts aged 18-35 in community and fellowship for six days, from June 3-8, 2016. The annual Continuing Revolution young adult Friends conference is a training-oriented, activating, and empowering conference experience designed to energize, inspire and connect young adult Friends with an interest in social action and social justice. Started in 2012, Continuing Revolution is modeling a new kind of content-driven and spiritually-rooted programming for this generation of young adults. 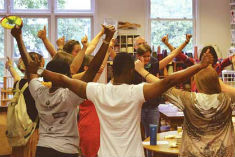 The conference series serves not only as an annual training and gathering opportunity for young adult Quakers seeking a more just world, but also to help facilitate a future in which young adult Quakers are organizing and mobilizing as a generation and a faith community for social change. With four hugely successful years behind us, our momentum only seems to grow. Pendle Hill is joyfully striving to create a space through this annual conference opportunity where this generation of Quakerism can come together in our work to focus deeply on each of the Quaker testimonies with the ultimate aim of co-creating a more peaceful, just and sustainable world. Will you join us?